If you are chasing BA tier points, it may be useful to add in a transcontinental sector when flying to the US West Coast or Hawaii. For most tickets, this does not cost any extra. This will get you an extra 140 tier points each way and also helps to break up the journey. You would also get a few extra Avios for the extra mileage. To get a price for multi sector itineraries, it is easiest to use google flights or ITA matrix which you can read more on here. 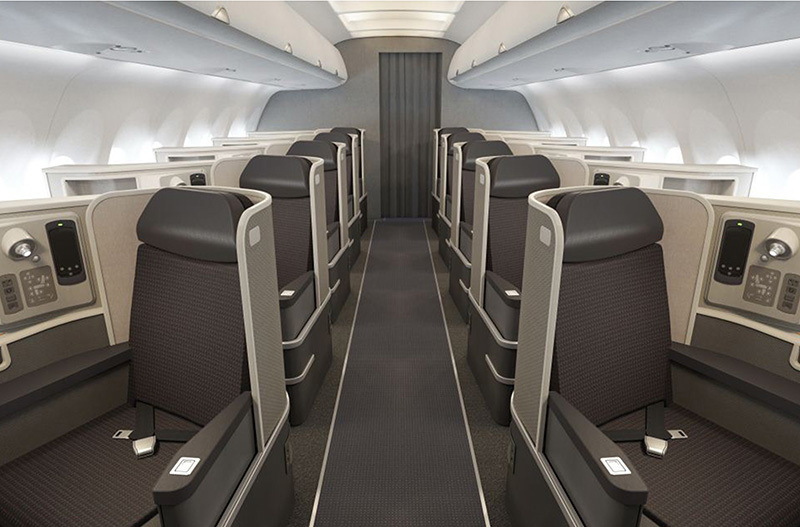 AA uses an A321 with 10 first class seats, 20 seats in business, 36 in Main Cabin Extra, and 36 in regular economy between New York and Los Angeles or San Francisco and on certain Los Angeles to Miami flights. I was on my way from Dublin to Honolulu, so I had stayed the night at JFK at the airport’s Hilton. This was in no way as bad as some of the tripadvisor reviews make out. Once in the airport, I ended up heading to the wrong place, as I had forgotten about the new JFK Flagship First area. I had entered from the opposite side of the terminal so hadn’t seen the Flagship check in which is separate to the main Premium check in. 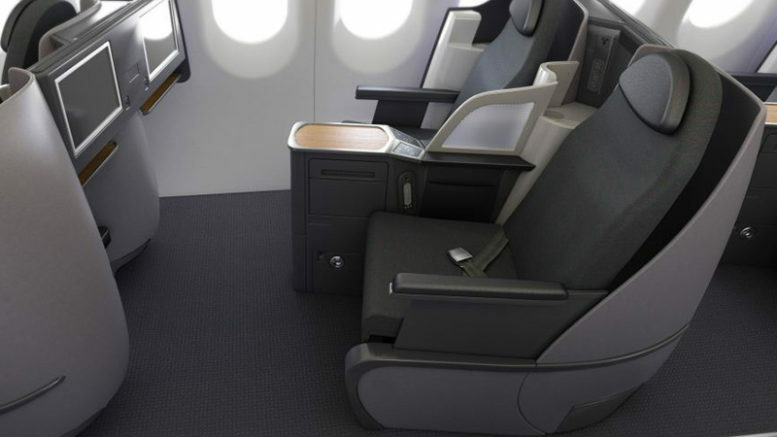 You can use the Flagship area if you are BA Gold or OneWorld Emerald or flying in a qualifying First Class cabin. At the main Premium check in there was no queue and the check in agent was very helpful. 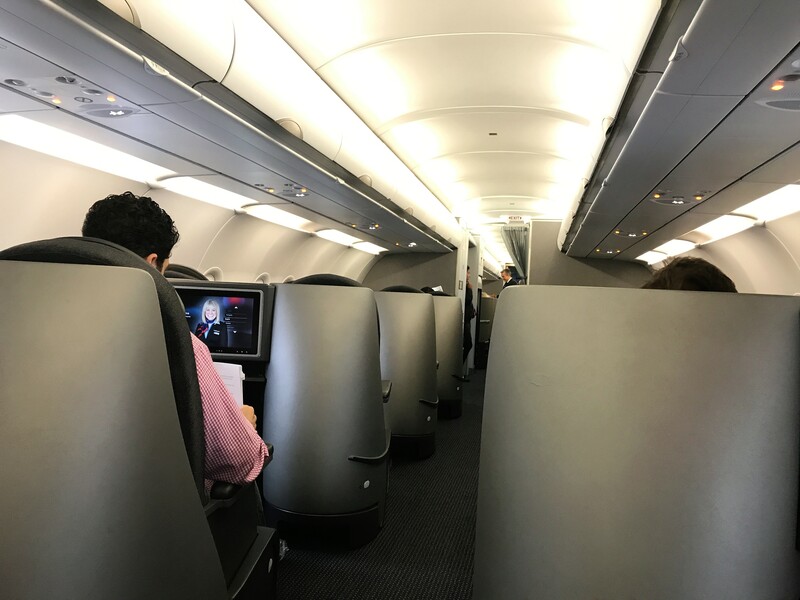 Seeing I was a OneWorld Emerald, she reminded me that in future I could use the Flagship First check in and that I would be better off going through that way for security. I walked round to the Flagship First to go through the security fast track. This apparently was a problem as it was 6 am and there was no non-TSA pre-check lane from Flagship First at that time. If you are unfamiliar, TSA pre-check allows you to undergo less security screening and you can get it with Global Entry if you are from the UK. As I wasn’t pre check, one of the AA staff escorted me to security and cut through the line for me. She waited until my ID was checked by the TSA and then left me at the front of the screening queue. I have to say this was very impressive although I did get a few glares from other people in the regular queue! Once through, I went to find the new Flagship First lounge which sounded very impressive. I will review the lounge in a separate post but suffice to say it was very good. Boarding started early again and I missed the start of it, so there was no queue when I got to the gate. There was a Premium boarding line which was empty and I was beckoned forward immediately. Once on board I found my seat in the last row. 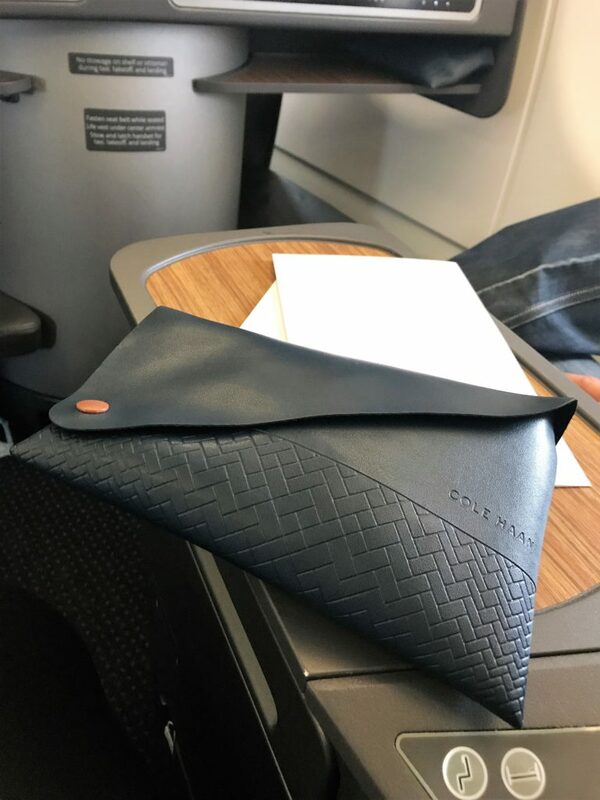 Already at the seat was an amenity kit with very similar contents to the one I had on the London to New York sector (review here). 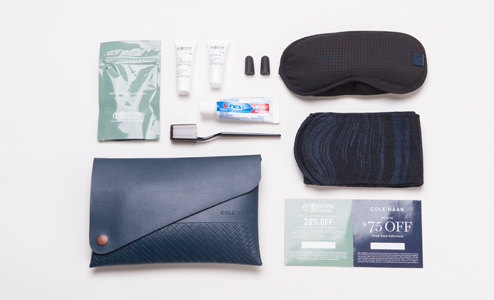 The current amenity kits bags across American Airlines flights are designed by American designer, Cole Haan. It contained CE Bigelow lip balm and body lotion, ear plugs, toothbrush and paste, socks and eyeshades. I actually preferred the bag on this one as it was a pouch which I find useful for bits and bobs in my hand luggage. 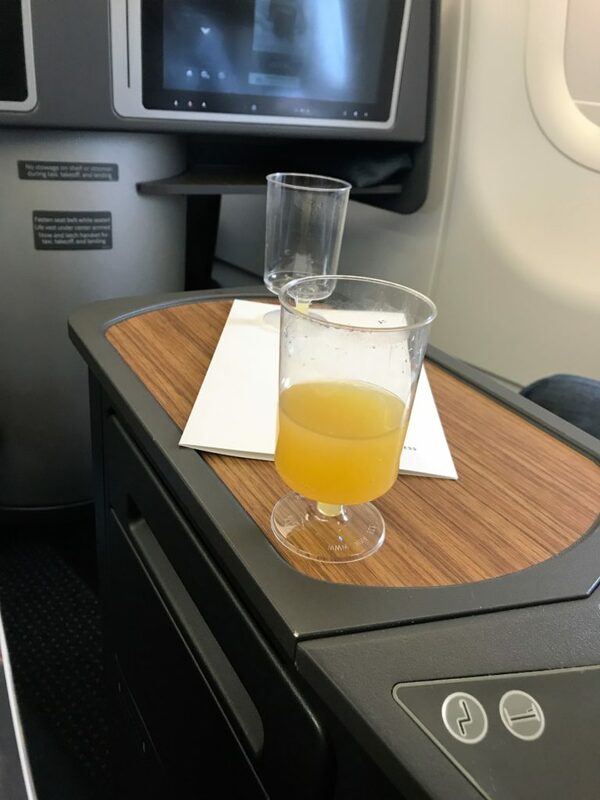 Once boarding was almost complete, the cabin crew came round with a choice of water, juice or mimosa. I chose the mimosa of course, despite it being 7.30am! As usual, it was served in a plastic wine glass. Also at my seat was my menu card and a bottle of water. The seats are not as good as the international business class as they are laid out 2-2. This is fine if you are a couple but not so good if you are flying solo. One tip is to always expect US domestic business/first class to be completely full. 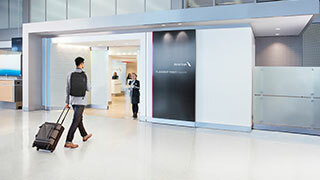 US airlines hand out upgrades to their frequent flyers, so there are always last-minute upgrades. Wouldn’t it be nice if BA did the same for their frequent flyers? I had selected the back row as it still had an empty seat next to me but lo and behold I was sitting next to someone who had been upgraded. Despite the 2-2 layout, the seats are excellent for a short flight. The seats are very slightly staggered to give some privacy but it doesn’t really work. Why they bothered to have the tiny little screen with slightly frosted glass in it I don’t really know. However, compared with a normal US domestic it was more private. Fortunately, I had a very considerate neighbour who only got up once during the flight (the fact that he was very easy on the eye didn’t hurt either!). The seats have a small narrow foot rest which I could manage to reach once I reclined my seat a bit. I found the seat to be very comfortable as a whole. 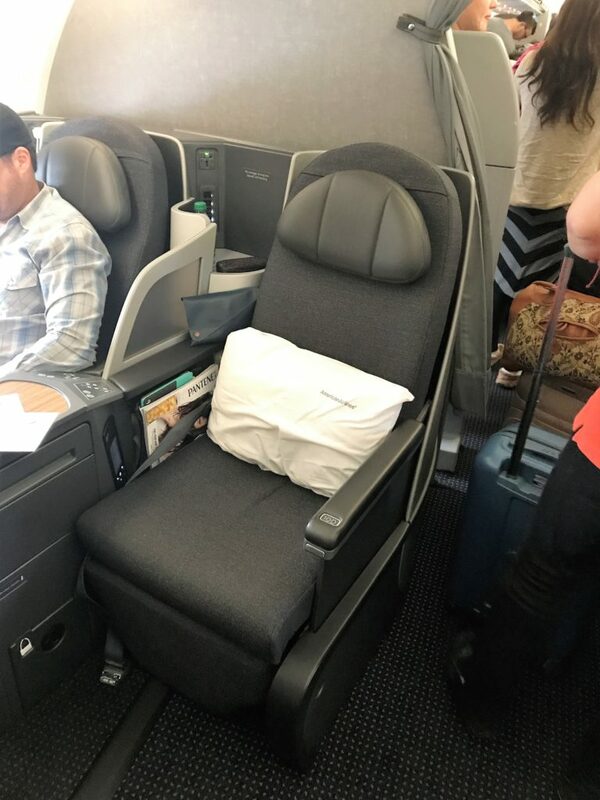 It didn’t have the same range of control as the transatlantic aircraft, but you could move the leg rest fully up and also adjust lumbar support as well as reclining. The seats recline to be fully flat and I did manage to get some sleep on the flight. Although the seats are a bit narrow I did find them very comfortable when lying down. They felt well padded and I was given the same lovely soft quilt and pillow as on the transatlantic sectors. Getting out from the window seat was not as bad as on a BA Club World flight. As there was no foot stool, the person next to you only has to step over your legs instead of the stool as well. For storage there wasn’t much you could use pre-take off but once in the air there was a handy shelf just behind me for headsets and a water holder. There was also a small shelf under the TV. If you needed to charge anything there was one socket and a USB port as well. It was in a useful location next to the small shelf so you could leave your phone charging there quite safely. 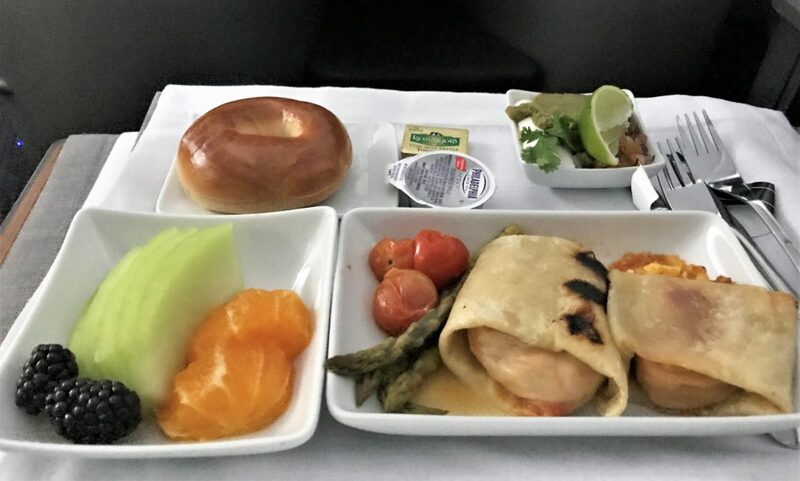 As it was an 8 am flight, the food was a breakfast service. They started with a drinks round where I chose another Mimosa, although this time it was in the stemless wine glass that I like. It was served with 2 plastic wrapped biscotti which I guess makes sense as I am sure most people would be drinking coffee. Again, I had pre-ordered my main course but I thought there was a nice selection if you like American food. I chose the burrito and it was delicious. I liked that they served the guacamole and accompaniments in a separate bowl so they didn’t get heated with the rest. They also offered a basket of warm breads and I chose a bagel with cream cheese to complete my American high-calorie carb fest! At least there was some fresh fruit to balance it all out. There was then a dessert offered which seemed a bit odd at breakfast time but seeing as we landed in LA at lunchtime, maybe that was why. The dessert was a chocolate caramel sea salt tart which sounded a bit much just after breakfast, so I declined. If you wanted the hard stuff they had a good range for a domestic flight. They didn’t have champagne but they did have prosecco. For wine, they had Napa Rose, Californian Chardonnay, Cotes de Gascogne French white, Australian Merlot and a Spanish Tempranillo. They weren’t as upmarket as a transatlantic service, but it was nice to see a Rose for a change. On the spirits side, they had the usual Tito’s vodka, Bombay Sapphire gin, Bacardi, Baileys, Amaretto and 2 whiskys plus 2 Bourbons. If you fancied a beer they had 5 to choose from and they had my favourite Mr & Mrs T Bloody Mary mix too. Before landing they offered a small snack but I still had a lounge visit and another flight to go, so I declined. You could have had a warm chocolate chip or snickerdoodle (whatever that is?) cookie or chosen from the snack basket which also had fresh fruit as well as more unhealthy choices. The crew were pretty typical for an American Airlines flight. They were slightly older, super efficient and polite but not overly friendly. On this service, the HD TV screens are seat back but they are a good size at 15.4-inches. There is a very wide range of entertainment options and there was the same range of films as on the transatlantic flight. If you wanted to watch TV there also numerous options to choose from including some box sets of recent shows. There were also games and music if you wanted. The remote was a touchscreen like the last flight but I found this one more responsive and had no issues operating it. 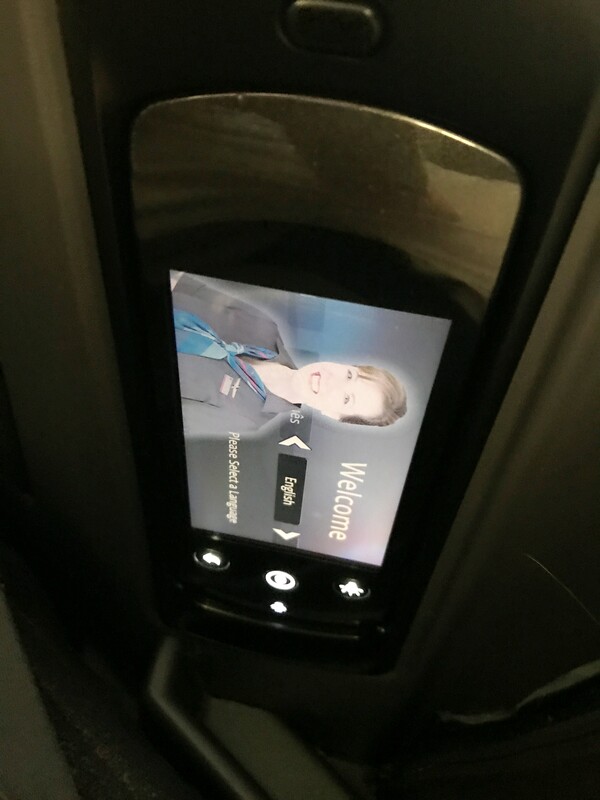 You can also operate the entertainment using the main touchscreen too. 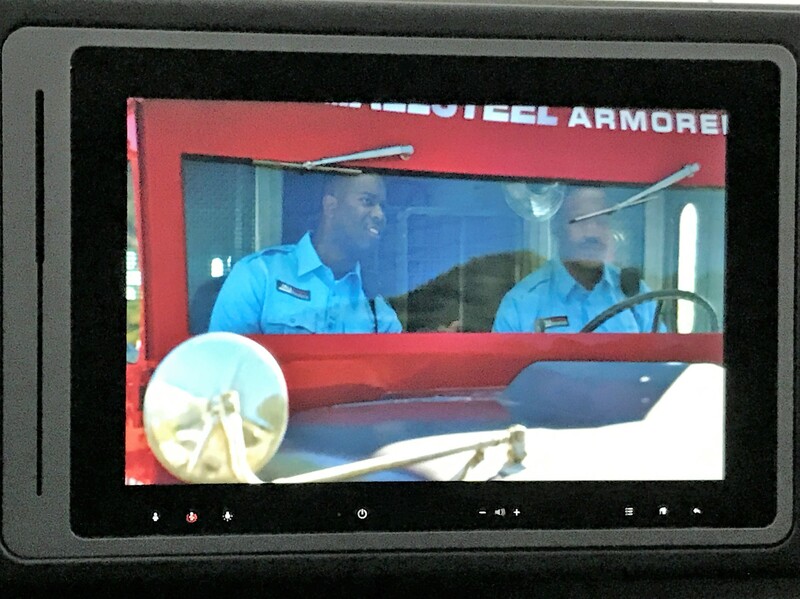 As I had such an early start, I decided to watch something that required little to no brain capacity, so choose to watch CHiPs. It was entertaining and reasonably amusing, what I would call a good plane film. The last thing I want is something really good where I end up snorting with laughter or bawling my eyes out. (that once happened when I made the stupid decision to watch the Fault in our Stars which ended up with a serious bout of crying during it!). Again, I chose to use the provided Bose Quiet Comfort Noise Cancelling headphones as I found them pretty comfortable. The aircraft was equipped with Wi-Fi. I thought it would have been nicer if they offered more than just a one day pass, as that cost a whopping $16 plus tax! It was of no use to me on my next flight that day as it was to Hawaii and the domestic Wi-Fi does not work over the ocean. If you wanted to use the Wi-Fi you can pre-purchase your pass here which is handy if you don’t want to be getting your credit card out on the plane. One useful thing to note is that you can use aa.com for free which is handy if you wanted to check something about a future flight or manage a delay/cancellation. We arrived at Los Angeles early but as is usual, we then waited ages for a stand. Overall I was impressed with my flight and I wish we could get the same level of domestic service with European airlines. 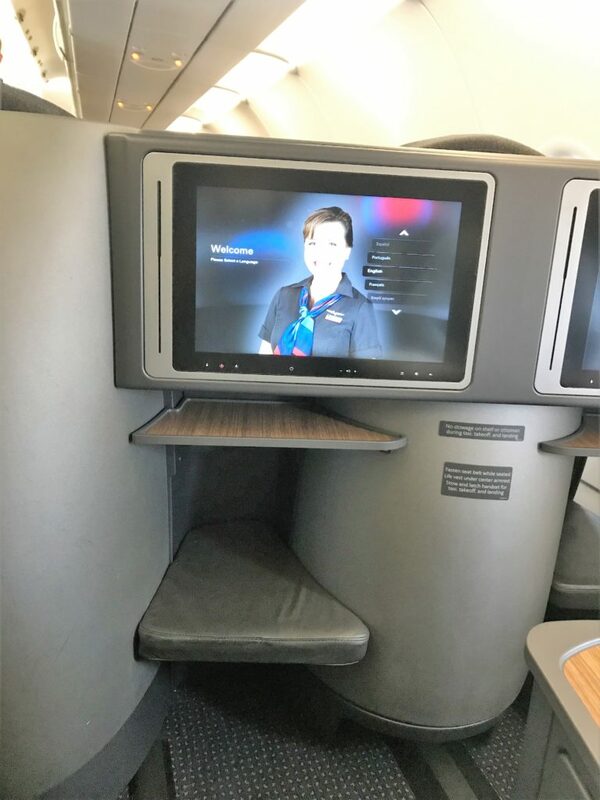 Although it does add considerable time to a journey to Hawaii, it was a comfortable way to travel and worth it for the extra tier points at no extra cost. 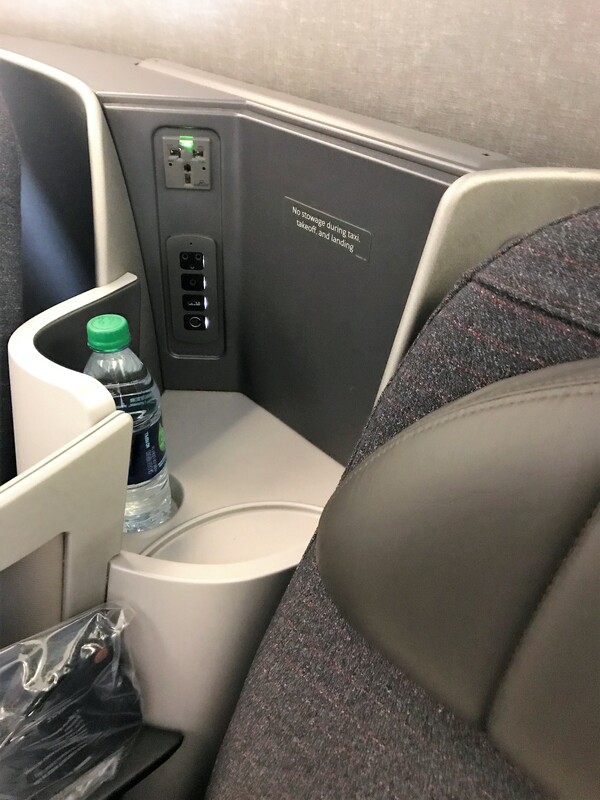 1 Comment on "American Airlines A321 Transcon Business class review"
Great article. just booked a TP run from INV-LAS for under £1k! and will get to try out this flight twice. TLFL, you are a bad influence on my travel hobby!